Tuesday was a day of firsts for two of the most prominent faces at Giants spring training. Madison Bumgarner took his first bullpen session after an offseason where his name was continuously included in trade rumors. It was also the first day for first time invitee Joey Bart, the Giants 2018 first-round pick that is already turning heads, and being pegged as the eventual successor to Buster Posey. 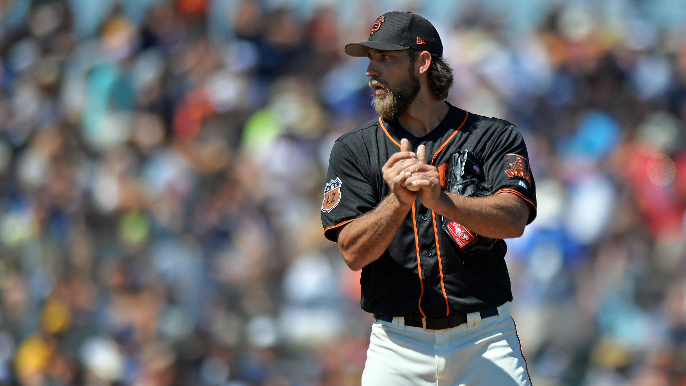 It also proved to be the first time that Bart would catch Bumgarner, who picked him to be behind the dish for the left-hander’s first bullpen session of the year, according to Kerry Crowley of the San Jose Mercury News. “I was kind of shocked, but it was fun,” Bart said afterwards via Crowley. Bart was apparently nervous to meet Bumgarner for the first time just days before, and said that catching him would be a “dream come true” at his locker before taking the field on Wednesday. “Let’s go on No. 1,” Bumgarner said to Bart via Alex Pavlovic. The bullpen session could be the first moment in a long partnership between the two players, assuming the Giants hold onto Bumgarner beyond this season, something that is far from a guarantee. It was predicted by many that Bumgarner would have already been traded by this time, and with his contract up at the end of the season, those rumors will continue to swirl until the trade deadline has come and gone. Bart on the other had could find himself with the big league club sooner rather than later if he continues to perform at a high level in the minor leagues. Bart had 13 homers in 51 games last summer, and will start this season in A-ball, where he is expected to quickly climb up the ranks.